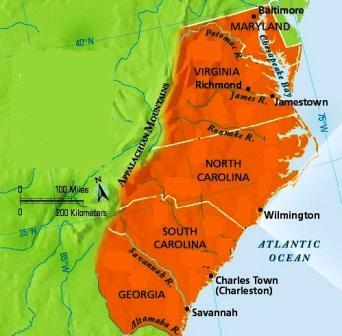 This Map shows the five Southern Colonies of Colonial America composed of Maryland, Virginia, North Carolina, South Carolina and Georgia. The Southern Colonies provides important information and interesting facts about each of the 13 Colonies including the date the colony was established, the region (New England, Middle or Southern) the systems of Colonial government, religion, details of trade and economic activity and the names of famous people associated with the founding and establishment each colony. For additional facts and info refer to Colonial Society. The Southern Colonies provides the ability to see at a glance the differences between the regions on a chart. There were considerable differences between the New England, Middle and Southern regions. Economic activities and trade were dependant of the environment in which the Colonists lived refer to Triangular Trade. The geography and climate impacted the trade and economic activities of Southern Colonies. 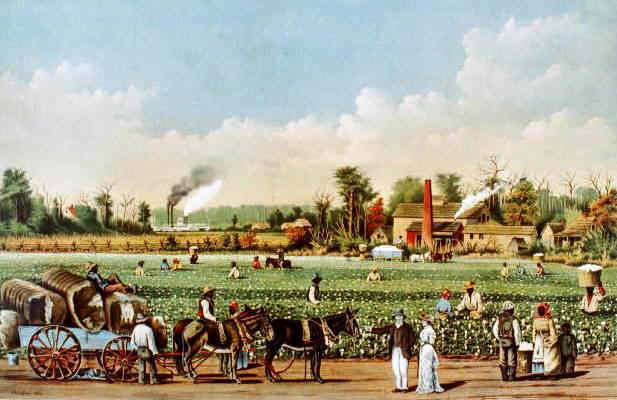 The Southern Colonies concentrated on agriculture and developed the plantations exporting tobacco, cotton, corn, vegetables, grain, fruit and livestock. The Southern Colonies had the largest slave population who worked on the Slave Plantations. Plantations grew cotton, tobacco, indigo (a purple dye), and other crops. Some of the Southern plantations were massive and consisted of the main house, slave quarters, a dairy, blacksmith's shop, laundry, smokehouse and barns which made the plantations to large degree, self-sufficient. Crops were traded for items that could not be produced on the plantations including farm tools, shoes, lace, and dishes. Propriety Government: The King granted land to people in North America, who then formed Proprietary Colonies. For additional facts and information refer to Colonial Government. The Southern Colonies were not dominated by a single religion which gave way to more liberal attitudes and some religious freedom. There were predominantly Anglicans and Baptists in the Southern region and Colonies. For additional facts and information about religion refer to Religion in the Colonies. The Southern Colonies article provides important information and interesting facts at a glance about the Southern Colonies including the date the colonies were established, the systems of government, religions, details of trade and the economic activities in the Southern Colonies. The names of important people associated with the founding and establishment of the Southern Colonies. A helpful, illustrated educational resource for teachers, kids and children. Discover interesting information and facts about the history of the Southern. For a more comprehensive history timeline detailing specific events relating to all of the 13 Colonies refer to Colonial America Time Period. This Southern Colonies Timeline provides a list detailing key events and dates of this amazing period in Colonial history. The five Southern Colonies of Colonial America composed of Maryland, Virginia, North Carolina, South Carolina and Georgia. A comprehensive list of the key events which are important to the Southern Colonies Timeline. 1630 The Great Migration - Mass migration of thousands of English people to the Americas that took place between 1630 and 1640. 1634 Maryland was settled. King Charles I gave land to George Calvert, Lord Baltimore to create a haven for Catholics in America. 1663 Carolina was settled. Eight men received charters for the Carolinas in 1663 from King Charles II to settle lands south of Virginia. The area was called Carolina. The main port was called Charles Town (Charleston) after the king. In 1729, North and South Carolina became separate royal colonies. 1686 Formation of New England - King James II combines the colonies of Connecticut, Massachusetts Bay Colony, Plymouth, Rhode Island, New York, New Hampshire, East Jersey and West Jersey into a single colony: The Dominion of New England. 1689 Mar 1689 Glorious Revolution Sparks Revolt in the colonies. Boston militiamen seize Governor-in-Chief Andros and put him in jail. 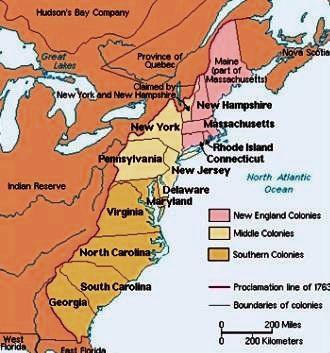 The New England colonies begin to re-establish governments. 1696 1696 Salutary Neglect. The British government establishes the Board of Trade to oversee colonial policies practicing a policy of "Salutary Neglect," in which it gives the colonies considerable freedom in economic matters. 1707 1707 The Union between England and Scotland created the 'United Kingdom of Great Britain' and the term British, as opposed to English, is then used in reference to the colonists in North America. 1733 1733 - Georgia is settled. James Oglethorpe receives a charter to create a colony between South Carolina and Florida. Georgia became a royal colony in 1752. 1758 The Anglo-Cherokee War (1758–1761) - The Cherokee uprising in present-day Tennessee, Virginia and the Carolinas. 1775 March 23, 1775 - Patrick Henry delivered his famous speech in St. John's Church in Richmond, Virginia.